Black Forest Lutheran Church, an NALC congregation in Colorado Springs, is in the heart of the area burned by the largest forest fire in Colorado history. The church building was spared by the fires, but destruction is all around the area. Seventeen of the homes destroyed by the fire belonged to members of Black Forest Lutheran Church. The Black Forest Fire began on June 11. 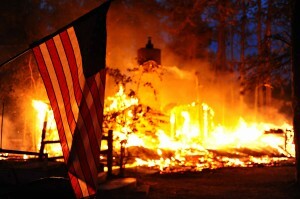 It had destroyed over 500 homes and burned more than 22 square miles by June 20. At the high point of the fire, nearly 40,000 people were evacuated — including half of Black Forest Lutheran’s members. Pastor Ken Hohag was away for a family wedding and about to begin a sabbatical leave, but he has returned to provide ministry to members of the congregation and community. “The devastation after the fire is hard to explain in words,” said Pastor Gemechis Buba, NALC Assistant to the Bishop for Missions, who was in Colorado and was scheduled to preach for worship at Black Forest Lutheran on Sunday, June 16. The congregation was in the evacuation area, so they were unable to hold worship at their location. Bethel Lutheran Church, a nearby LCMC congregation, invited Black Forest members to worship with them that Sunday. “I conducted a healing service on Sunday at Bethel Lutheran congregation, where all of our Black Forest members and members of Bethel were gathered for this service. It was a large gathering that started with a community breakfast, and the service was full of prayer, remembering promises of God, many worship songs, and Communion. I preached, prayed, and served Communion,” Pastor Buba said. Black Forest Lutheran Church has a long history of mission work both locally and globally. Their members will be responding to those in their area devastated by the fires. They are forming service teams to help in the cleanup effort.